Clay pot gift baskets are so easy to make and will win the heart of your friends and loved ones. Itâ€™s simple and easy to create custom gift baskets of your own. When you make the basket just think of what the person who will receive it likes. Paint clay pots of all sizes and when you need a gift all you have to do then is figure out what you want to put in it. When you paint the pots you can make them simple or get really fancy and paint a design or scene on them. Just remember that if you paint the outside of the pot you need to seal the inside of the pot so that people can plant in them. People love the clay pot gift baskets because they are so unique. Fill a flower pot with gardening gloves, hand tools, seed packets, garden books, magazine subscriptions, knee pads, and pretty hat and anything else that goes with gardening. Finally, put a bright green bow to make it look like Spring. Fill the pot with childrenâ€™s artwork, family videos, handmade ornaments, small gifts your child has made for them, candy, family pictures and coffee or tea. If they live a ways away from you how about a long distance calling card. Place a bottle of wine or non-alcoholic beverage in the center of the pot. Fill the rest of the pot with something sweet. Everyone loves chocolates, gourmet cookies and nuts and dried fruits. You could add a variety of cheeses, crackers and salami. These are fun to make. There are all kinds of craft supplies. Fill the container with paint brushes, craft knives, acrylic paints, craft paper, glue gun, glue sticks or any other supplies relevant to their hobby. Be sure to put a pretty bow around the pot. For your best friend or relative encourage them to take some leisure time. Fill the pot with scented soaps, bath salts, bath gels, lotion, body sponge back cleaning brush and a relaxing CD. You can even get them the special towel for their hair. Another thing that would be nice is a scented candle and candleholder. Another neat idea is to get them a good book so they can just lay in the bath tub and relax and read. These are fun to make because there are so many things you can put in the pot. There are baby wipes, lotion, powder, diapers, booties, bottles, pacifier, bibs, baby thermometer, onesie t-shirts, baby blankets and even a baby book. Also a nice thing is a little photo album that the mother can fill with pictures. After you have everything you want to put in the pot, put some filler in the bottom of the pot like shredded paper, tissue papers or even colored towels (everyone can use towels). Arrange your items and don't forget to put a pretty bow on the pot. 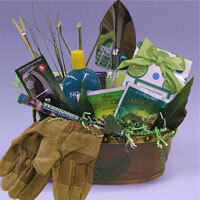 There are many types of clay pot gift baskets that you can make so just use your imagination. Arts and Crafts are so much fun because there are thousands of things you can make to give away as gifts. If you are like me you also want to decorate your own home to reflect your life style and you can with crafts.